What is The Hollywood 48-Hour Miracle Diet®? The Hollywood 48-Hour Miracle Diet® is a tasty juice blend that’s been fortified with vitamins, minerals, and select essential oils to create the perfect combination of taste and effectiveness. Ingredients like pineapple juice, banana puree, Vitamins B and C, Folic Acid, and Bergamot help create a flavor profile that has users raving and harnesses the power of Mother Nature to cleanse toxins, satisfy hunger, and maintain energy levels throughout your two-day diet. This proprietary blend helps keep you hydrated, maintain a proper chemical balance in your blood stream, and give your body the essential nutrients it craves while eliminating the unnecessary calories and complex carbohydrates it doesn’t. The Hollywood 48-Hour Miracle Diet® was first crafted over 20 years ago after its creator visited a European health spa for weight management. The technique these practitioners were using was tremendously effective and unlike anything he had seen stateside. Inspired to create an affordable product everyone could use to lose weight and detoxify safely, he began experimenting upon returning home. At last, in 1997, the formula was perfected and the powerful blend of tasty juices and other essential ingredients was released to the public. While The Hollywood 48-Hour Miracle Diet® was designed specifically to help overweight individuals lose weight fast, other benefits were soon discovered. Now The Hollywood 48-Hour Miracle Diet® is used by thousands of people for a variety of very personal reasons—from weight loss to clean living. The Hollywood 48-Hour Miracle Diet® has been scientifically proven with multiple studies to help people lose up to 10 pounds in just 48-hours. When used as directed this wonderful product produces tremendous results—visible results—that people can see on the scales and in the mirror. As diets go, The Hollywood 48-Hour Miracle Diet® falls into the category of calorie restrictive diets. Essentially, The Hollywood 48-Hour Miracle Diet® limits your caloric intake to around 400 calories per day—roughly 15% of what the typical American male consumes. By limiting your calories, you’re instructing your body to start burning through the stored energy available rather than relying on the calories from the food you’re eating. But The Hollywood 48-Hour Miracle Diet® helps maintain a positive level of physical energy instead of causing users to “crash” into a sluggish state of lethargy. That’s partially thanks to the incredible blend of micronutrients (vitamins and minerals) that are added to The Hollywood 48-Hour Miracle Diet® to help maintain a “normal” level of these chemicals within your blood stream. “I started using this product, “Juice” (as we called it) over 10 years ago. This is the first time I ever posted a review. People always ask me about it (including the clerks that sold it). I lost over 40 lbs with the Juice. I’d never looked or felt better.”- Lee K.
“I love this product and it tastes great! I just finished my 2nd day and I did lose 5lbs. I also lost inches off my belly. I actually felt non sluggish while on it. I didn’t get any hunger pangs or feel any different. I felt so much better than I would’ve had I had some of the things i have been eating!”- Melissa T.
And, because you see results so quickly when using The Hollywood 48-Hour Miracle Diet®, you can use this product to “jump start” a healthier life. One of the biggest struggles to overcome on any weight loss journey is your own psyche. Seeing 5, 10 or more pounds drop off within just two days is a tremendous psychological boost for anyone, especially if you’ve experienced disappointments with other diets. That can give you the mental fortitude necessary to stay strong and make even more healthy choices like eating better foods and exercising regularly. Plus you can use The Hollywood 48-Hour Miracle Diet® repeatedly in the future to get that same “jump start” every time you need a little boost! Fasting diets are tremendously effective and have been scientifically proven to help people shed pounds and actually reset their body chemistry. Some studies even suggest that these types of diets can decrease a person’s risk for certain diseases in the future. By far the most popular of the fasting diets available is the intermittent fasting diet or 5:2 diet. This type of fast allows people to eat normally five days out of the week while they fast (either completely or partially) the remaining two days in order to dramatically decrease their weekly caloric intake. 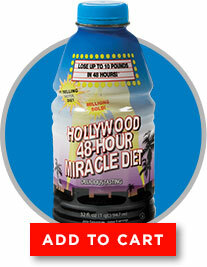 The Hollywood 48-Hour Miracle Diet® can be used as a part of a fasting diet because it’s naturally low-calorie. Plus the nutritious blend of juices and micronutrients can help maintain proper blood chemistry without adding empty calories and unnecessary carbohydrates. The Hollywood 48-Hour Miracle Diet® is packed with essential vitamins like B, C, E and other nutrients like Folic Acid, and Niacin. These are building blocks that your body needs which, sadly, many of us are deficient in. While the main benefit of The Hollywood 48-Hour Miracle Diet® is obviously the weight loss, it can be used as a healthy alternative to sugary “junk foods” because the formula was crafted so precisely. “Oh my gosh, this stuff tastes SO good! We’re not drinking it for weight loss, but for its general health benefits. We can drink this all day long and stay away from all the unhealthy junk foods during the day!” – Ken G.
One of the best things about The Hollywood 48-Hour Miracle Diet® is that there’s no stress involved. Everything you need comes in one bottle. All you have to do is add water as directed and drink. There’s no complicated meal planning, no calorie counting, no points system, and no booklets to carry with you. Simply enjoy life as you normally would and replace the meals you’d normally eat with The Hollywood 48-Hour Miracle Diet®. You’ll see tremendous results quickly and be amazed at how easy this “diet plan” is to follow. “I have always had a hard time finding something that actually helped me stay on track of losing weight. I’ve tried pills, work outs, diet plans and I always broke the routine within a few days. With the Hollywood 48-Hr miracle diet I lost 12lbs in 2days! It was easy to stay consistent with it (only 48hrs to do so) and it was super good to drink!” – Cassie W.
We’re assaulted by harmful toxins every day. They’re in the foods we eat, the air we breathe, and even the water we drink. And some of those toxins build up in your body so fast that your organs can’t process them quickly enough. The Hollywood 48-Hour Miracle Diet® can help eliminate those toxins by giving your body the opportunity (and time) it needs to fight back. By swapping The Hollywood 48-Hour Miracle Diet® for the foods you’d normally eat, you give your body an essential rest period during which your kidneys, liver, and other filtering organs can naturally flush those built up toxins, leaving you healthier, more energetic, and ready to face life at full speed. And it only takes two days! “Great for a weekend system flush” – Cali K.
As you can see, The Hollywood 48-Hour Miracle Diet® is many things to many people. It’s a weight loss solution. It’s a natural juice cleanse. It can be used with fasting diets. It can even help your body self-regulate so you can function better. If you’re looking for an easy, affordable way to live healthier, (whether or not you need to lose weight) try The Hollywood 48-Hour Miracle Diet® and experience the benefits first-hand.